Our amigo, Art Pedroza, over at the Orange Juice Blog posted an entry yesterday entitled, "O.C. 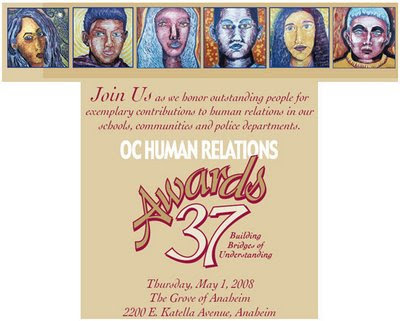 Human Relations Commission announces 2008 Award Winners". If you click on that title you will be linked directly to his entry, which describes the awards and the 2008 recipients. This is the 37th annual presentation of such awards. I "borrowed" the graphic above from Pedroza's post. "The school’s student-led Human Relations Council launched a campaign to promote student voices and unity by bringing diverse campus groups together to integrate a message of “Ubuntu” or the “spirit of community” into their programs and activities. The Council has made significant strides in institutionalizing an integration of human relations issues and student voices into many aspects of school wide policy." Congratulations to the students of Corona Del Mar High School for their efforts, which demonstrate enlightenment and maturity uncommon today. I post this entry today as a contrast to the Costa Mesa City Council's approach to human relations. Readers will recall that, not too long ago, the council led by then-mayor Allan Mansoor first de-funded, then disbanded without so much as a thank you the Costa Mesa Human Relations Commission. That organization served as a communications bridge between the city's diverse population segments for almost two decades. Then, quite recently, Mansoor showed his attitude about this subject again. Following the annual presentation by a representative of the Orange County Human Relations Commission on incidences of intolerance within our city, Mansoor stated emphatically from the dais that he no longer was interested in hearing such reports. When he was reminded by the City Manager that such reports are provided as a matter of course each year Mansoor reaffirmed his unwillingness to hear them in the future. Such is the sad state of affairs in our city - when the elected leader thumbs his nose at even the thought of improving human relations in our city you know we are dealing with a sadly unenlightened man with the power to enforce his will upon all of us. This is something to remember as the election grows near this year. Although Mansoor isn't running, his buddy, Mayor Eric Bever and possibly several other so-called "improver" candidates, may be on the ballot. Our city will not be well-served by perpetuating intolerance by electing people who share Mansoor's attitude and values. So, tonight - appropriately, April Fools Day - as you watch the city council meeting, think about them as they spend your tax dollars and set policy that will govern your lives. Think about their motives and ask yourself if they coincide with yours.